Studies have shown that infectious diseases have adapted well to be able to survive outside a host body. Infectious diseases have found ingenious ways to get from an infected host to a new uninfected susceptible victim. A good biosecurity program will stop or impair the spread of infectious diseases. An intelligent and economical way to prevents the spread of disease in your livestock, greenhouse or storage facility. 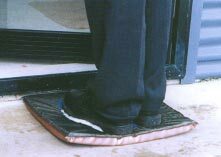 Place the Disinfection Mat at entrance, pour up to 2.65 gallons (12 L) of disinfectant into the mat and step onto it before entering the building. Sides and bottom of the Disinfection Mat will not leak. To clean simply rinse and let it drain overnight. Our DISINFECTION MAT, 34” x 34”, holds 2.65 gal. (12 litres) of disinfectant. We recommend VIRKON at 1% or other good disinfectant. Virkon is a bactericide, virucide and fungicide. The DISINFECTION MAT is sealed, sides and bottom. The surface of the Mat is made of extremely rugged material and very little, if any, solid matter will penetrate the Mat, thus reducing any chance of neutralizing the disinfectant. 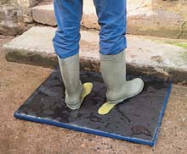 - made of the same tough material as our Hoofmats and Disinfection Mats. The MINI MAT features a strong mesh upper, welded to an antibacterial PVC outer. Outer dimensions: 45cm x 45cm (18" x 18"), 25mm depth. Liquid Capacity: 3.5 litres of disinfection solution. With bio-security measures becoming stricter in many agricultural and horticultural sectors, it is becoming necessary to institute a biosecurity program that will prevent the spread of viruses and bacteria. Dirt and manure are culprits in transferring many of these diseases from one location to another. 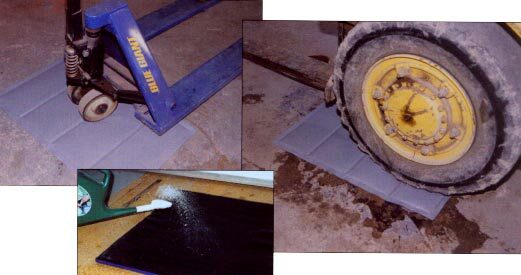 By placing the Forklift Disinfection Mat at the entrance to any building or greenhouse where a forklift will be passing through, you will reduce the possibility of viruses and bacteria being transferred by the forklift tires. The Forklift Disinfection MatTM is made of a tightly woven material which allows disinfectant to soak into the mat. As the forklift drives over the mat, the disinfectant squelches up out of the mat to disinfect the tires and then soaks back into the mat once the forklift has passed. Larger debris is not able to penetrate the mat and can be swept or hosed off. Forklift Disinfection MatTM - an important part of a good biosecurity program.